2007-11-22 by Alessandro Pasotti filed under Linux. Toshiba Satellite U300-11S works quite well, almost everything worked without too much troubles (the only device that doesn’t work at all is the internal modem, the only device that works just partially is the webcam). The distribution I have installed is Kubuntu 7.10 (Gutsy Gibbon) 64 BIT version. Don’t work out of the box, to fix it: apt-get install linux-backports-modules-2.6.22-14-generic A small issue remains, the volume control is bound to the headphones instead of the speakers, to control the speaker volume you must use the software controls. The integrated microphone works just fine. Don’t work out of the box, to fix it: wget http://ppa.launchpad.net/kyle/ubuntu/pool/main/x/xserver-xorg-video-intel/xserver-xorg-video-intel_2.1.1-0ubuntu10_amd64.deb sudo dpkg -i xserver-xorg-video-intel_2.1.1-0ubuntu10_amd64.deb then: dpkg-reconfigure xserver-xorg External monitors works great: just use something like this: xrandr --output VGA --auto 3D acceleration is quite good and glxgears gives about 1150 FPS. Thanks to Mihail (see comment) we now know how to make it work. See also this page for source compilation and other details: http://ubuntuforums.org/showthread.php?t=316358 If you don’t want to compile yourself, here is my working module for kernel 2.6.22-14-generic: omnibook.ko Copy the .ko file to /lib/modules/2.6.22-14-generic/kernel/drivers/misc/ as root, then run depmod -a modprobe omnibook cat /proc/omnibook/bluetooth Yuo should see the message: Bluetooth adapter is present and enabled. dmesg Check dmesg output, you should see something like: [ 1660.325466] omnibook: Driver version 2.20070211-trunk. [ 1660.325534] omnibook: Toshiba Satellite U300 detected. That’s all, your bluetooth is enabled. To enable permanently you need to load the module at startup like explained in the above mentioned forum page. Works fine, both ethernet and wifi. Ethernet controller: Realtek Semiconductor Co., Ltd. RTL8101E PCI Express Fast Ethernet controller (rev 01) Network controller: Intel Corporation PRO/Wireless 3945ABG Network Connection (rev 02) The wireless adapter works with a non free driver, ubuntu installed it automatically. WPA/PSK encryption works, other configrations not tested. Works fine, tested only with an SD card. Sometimes (at random) closing/opening the lid does not trigger suspend, software and harware (on/off button) controls work allways ok.
Webcam doesn’t work out of the box, to fix it (partially) you must install the right driver, follow the instructions from http://linux-uvc.berlios.de I was able to record a short video with ffmpeg, other programs just segfault. I like it, it’s a small but not too small laptop, quite affordable and Linux runs well. Everything works (almost perfectly) except the internal modem. I just hope they will give the money back for the unused Windows licence. Can you tell us what is the wireless chipset? An ‘lspci’ would also be very appreciated. I just thought it was too technical, but indeed it could be useful to check if two differently labeled models have the same hardware or not. Does the your keyboard have any flex in the “hjkil” zone ? Yes, the keyboard seems quite poor (too flexible) in the hjkil zone, but I didn’t notice overheat on the keyboard, instead I notice overheat at the left side of the touchpad. Thanks for this post, I’m looking forward to get that notebook and I’m only a Linux user. Btw, under Gnome, you can assign the volume control to the audio channel you want. On my Satellite L100, the function keys used to control the volume but it stopped working a while ago. Now I need to assign the key to PCM in the audio prefs. Not sure if this would work with a dimmer though. How is battery life? I have a u300 and i get 20-30% less battery life compared to vista… do u know a way to fix it? Sorry, I don’t run vista. Battery life here is about 2:30 h without intense CPU jobs. I have this laptop – U300 14B, installed linux, works great as you say, only problem i can find is that i cant seem to get the bluetooth working on it!! any suggestions? I will add a note in the article to indicate that BT should be further investigated. Ubuntu 7.10 doesn’t detect my Bluetooth adapter. I know its there because Windows Vista does show the adaptor and it works just fine. When I run lspci I don’t see any Bluetooth reference. Running lsusb doesn’t show any Bluetooth adaptor either, just the Chicony USB webcam. hcitool dev nor hciconfig show Bluetooth devices. Any ideas? Has anyone had positive experiences with their Toshiba Satellite Pro U300 and its Bluetooth adapter? I got a U300 recently. The problem I have is that the integrated microphone doesn’t work. I just get nothing when I try to record from it. The integrated mic works on my U300, I can record and make skype calls. Are you using ubuntu gutsy 64bit with the patches I suggested in the article? Why are you using AMD 64 packages if you have an Intel Processor? I agree it’s confusing, but since AMD was the first to release a consumer 64 bit processor, for historical reasons the 64 bit versions of Linux are named amd64. Both Intel and AMD 64 bit CPU share the same specifications, so the amd64 packages are suitable for both CPU families. Bluetooth works well on u300! You have to use omnibook driver to enable this. in the middle, and have fun! as i’ve been using linux only a few months, when I saw this…well, I’m not quite sure what to do! I thought about editing the code directly, but where is the omnibook source located? Make sure you are using exactly the same kernel version and linux distribution (mine is ubuntu gutsy amd64). You must download omnibook sources as indicated in the ubuntuforum article, they are not installed by default. On a core 2 duo you can install 64 bit distributions. 32 bit will also work but will be somewhat slower. The drawback of 64 bit distributions is that you will have a hard time finding (closed source) codecs for some multimedia formats (like mms for instance). okay…been trying this all day…no luck. please, someone, an idiots guide, please! I followed the cmd for the lazyboy.It doesnt work. No luck to active the bluetooth. I will give it one more try. I have the u300-13u model. I’m noticing the fan on the left hand side (closest to the screen) coming on every few minutes or even every 30 seconds for a 5 second burst even when I only have a web browser running. I’ve got Ubuntu Gutsy running at the moment. Firstly, does this happen on your models and secondly, does anyone know of any way of controlling this activity (modifying the tolerances for the fans or something similar)? I don’t know how to control this, but whenever this happens I check the CPU activity with the command “top” and I see firefox or other applications eating up to 60% CPU. When the CPU activity is relatively high the CPU can become hot and the fan starts automatically. I keep on finding little things not quite working with ubuntu on this laptop (u300 14b). I cannot seem to get compiz working on it, the GM965/GL960 graphics controller is not supported so I can’t get nice little effects with it such as those in compiz-fusion. I am still trying to get the bluetooth working on it, I cannot get DVD playback even with all the gstreamer plugins and even with xine. If anyone has an answer to any number of these problems, i would be grateful. I didn’t test compiz, I’m on KDE. BTW 3D acceleration works fine so far. hey i have a u300 and the webcam doesnt work! Even though I cant show off the wonders of compiz-fusion, its still a great linux runner isnt it… anyone who can get that to work, i will love them forever…(well, not really, but you know what i mean). Thanks for the great howto and the deep research. I got today my U300-14q but I’m getting trouble with video. First, laptop’s screen looks ok but 1/4 shifted is not used by the bar. Second, I only was able to mirror monitors and didn’t manage to extend the laptop’s screen to my LCD monitor. Do you mind to post your xorg.conf to try with your settings? took me a while to find out why, but the toshiba had 4 partitions on it already(d:, recovery partition, etc) and that seems to be the maximum. I had to delete the d:\ in windows and then it worked fine. my U300-13E with ubuntu hardy heron is working fine. Only modem agere now LSI “11c1:1040” is not working. Any news from LSI about support? 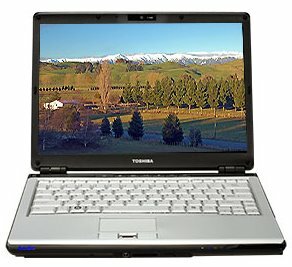 I have a Toshiba U305 – S7467 and it works great (with Ubuntu Hardy Heron) with the exception of modem and Bluetooth. I compiled the omnibook module modifying the laptop.h in a way similar to the one suggested by kaotiklabs, but I have not been lucky? Any input or help? I don’t think that U300 pro and U305-7467 uses a different blueetooth chip, so my hope is to be able to activate it. I used this page to configure Kubuntu on my Satellite U300-14U, which all seemed to work well as described here. However, since the last update (21) of my kernel on Kubuntu 8.04, there seems to have been a change in the driver of my wireless device: some wireless networks are listed, others aren’t (amongst which my home network). If I reboot with kernel 19, all is well again, and the same wireless networks as before are listed. Does anyone know about the difference? Are some wireless networks somehow ‘filtered’ differently? Hi, I have Toshiba U300-11Z with Ubuntu 8.10 on it. I’ve upgraded recently from 8.04 – everything seems to work quite fine with the only exception of the sound. I’ve fixed the problem with no sound by uninstalling PulseAudio but still I have a problem with the “hard” sound control – once I touch it, an icon of sound control appears and remains twinkling and the computer freezes. Tnx for any idea. thank you for your comments, if somebody still need to be convinced about the advantages of open source, this is the definitive proof that cooperation and the possibility to modify the software can solve all problems. Do you have a module for bluetooth adapter for kernel 2.6.32-25? Thank you and wait for your reply.